The infusions flavors are Lemongrass Mint, Lavender Citrus, and Silkroad Chai. 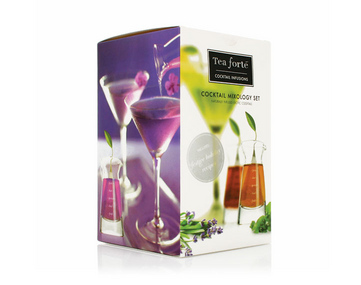 There is a little booklet with recipes for cocktails and mocktails, too! 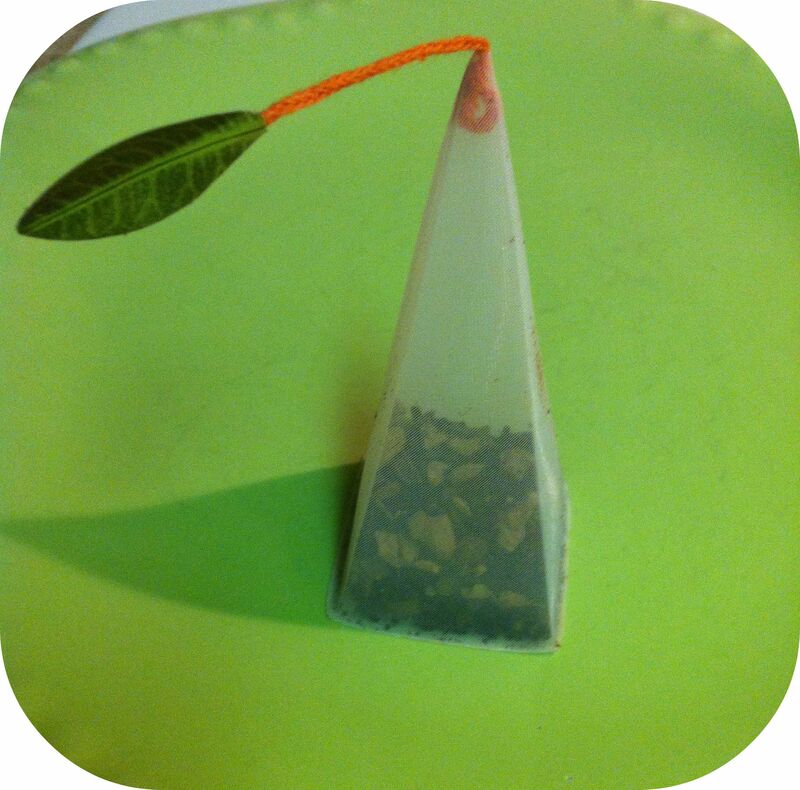 So you just put the ‘tea’ bag in a glass and pour alcohol over it and steep for three minutes. Just like tea! But you can add different ingredients to make all kinds of cocktails. The recipes for the Lavender Citrus infuser include: Cosmo de Provence, Lavender Pear Martini, and Lavender Lime Rickey. The Chai recipes include: Peach Chai Crush, Chai White Russian (sounded amazing! ), and Bombay Chai Rum & Tonic. 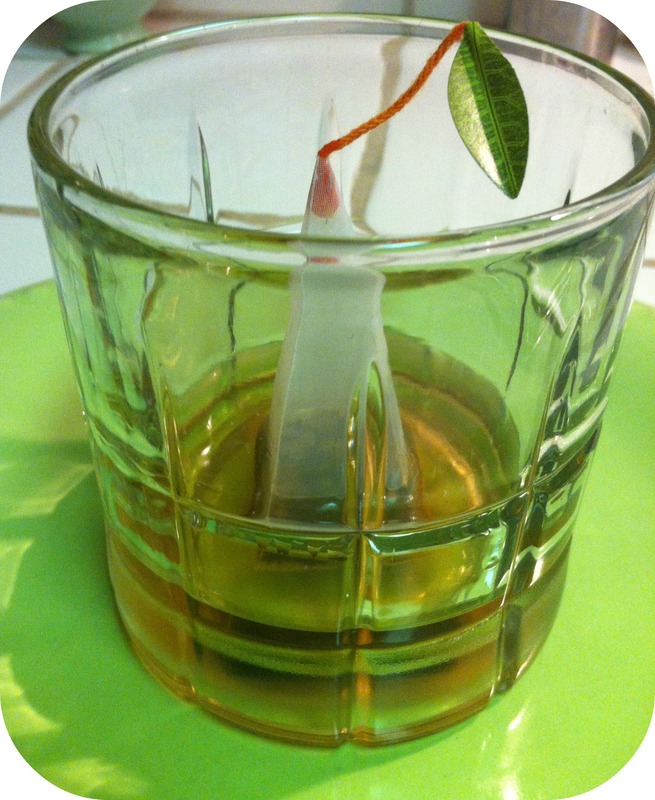 The Lemongrass infuser recipes are: Bali Breeze, Lemongrass Gin & Tonic, and Wild Mint Mojito. The mocktails include Lavender Fizz- Lavender infuser with lemon/lime soda; Virgin Sunrise- Lavender infuser with orange juice and seltzer; and Chai Cooler- Chai infuser with ginger ale! They all sound so refreshing! 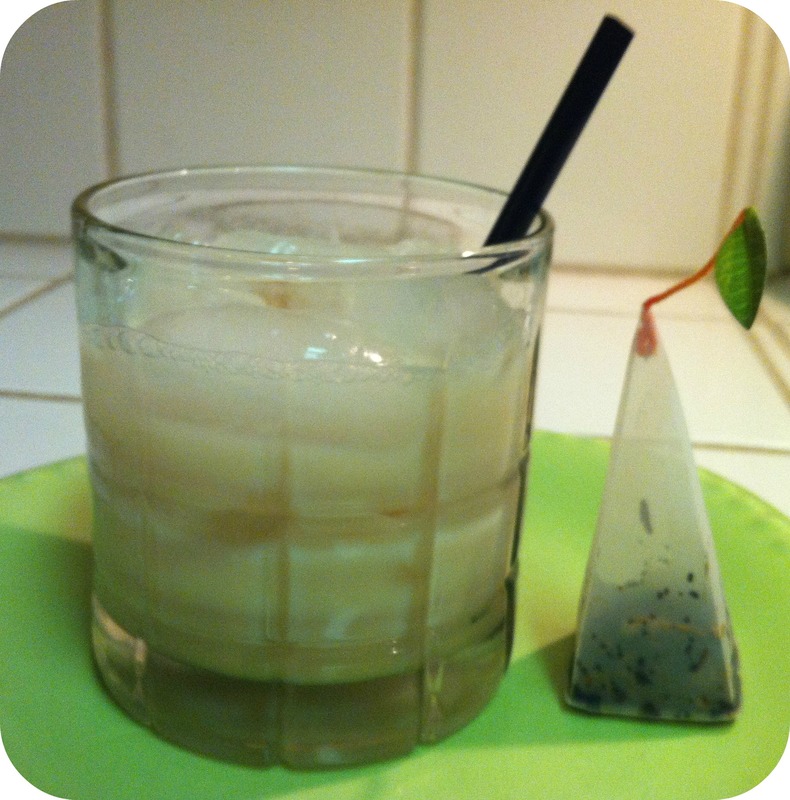 I decided to make the Chai White Russian because I had the ingredients on hand and I love chai AND white Russians! The recipes says to infuse the chai bag with 1 1/2 ounces of vodka (I used vanilla vodka), then add 1 ounce simple syrup and 2 ounces of light cream ( I used soymilk) over ice. Santa Claus- where did you find these??? A quick internet search revealed they are available at specialty stores and fancy department stores and also online through their own website, amazon, etc. I steeped 1 1/2 ounces of vodka with the infuser, but I only used 3/4 ounce in my cocktail (saving the rest for another drink). I ended up steeping it for about 10 minutes because I wanted to get as much flavor our of the infuser as possible and it seemed like it needed much longer than three minutes. I made a quick simple syrup (equal parts water and sugar, heat in a small sauce pan till sugar dissolves). Then mixed according to the instructions. WOW! The Chai White Russian was easy and fun and super tasty. I loved using the pretty little bag, too. It was definitely a ‘craft’ cocktail as it almost took me longer to make it than to drink it, but that was mostly due to the fact that I needed to make the syrup. I definitely plan to enjoy an infused cocktail again! I’ll be sure to let you know what I make next. Cat Friends! Now Starrrring: Mai Tai! Mai Tai lives next door with her approximately 80-year-old cool owner. Mai Tai visits us frequently because of the many bird feeders I have in the yard. Mai Tai isn’t into the whole camera thing so I took these pics from the house. 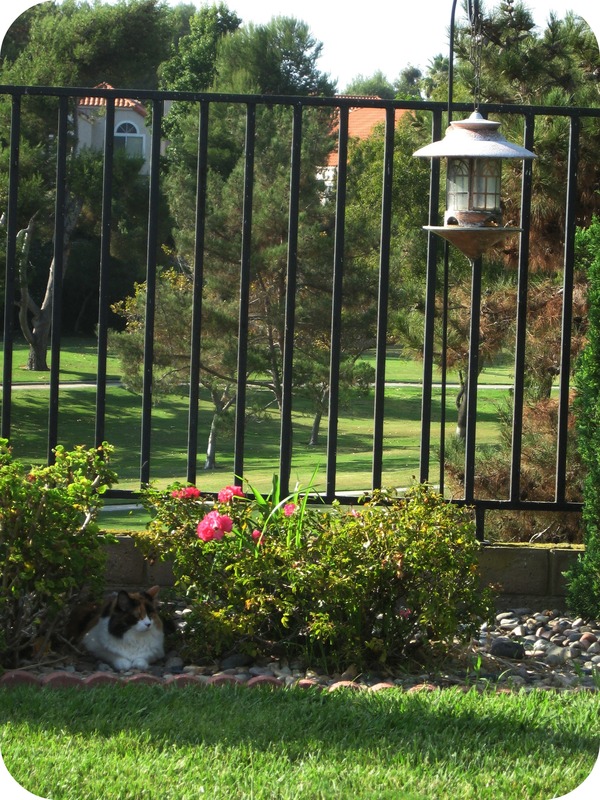 This next pic shows the bird feeder that she stalks – I mean visits – even tho she doesn’t have a chance of getting any birds. Matter of fact, she’d be cheesed off to know that she actually saved a bird’s life last week. She was sitting out there staring intently at the feeder – so intensely that it made us suspicious. When we looked closer we realized a bird had gotten it’s little head stuck in one of the feeder’s seed opening! Jim [Chris’ equally fabulous husband] carefully got the little guy out but I don’t think that’s the outcome MT was hoping for. 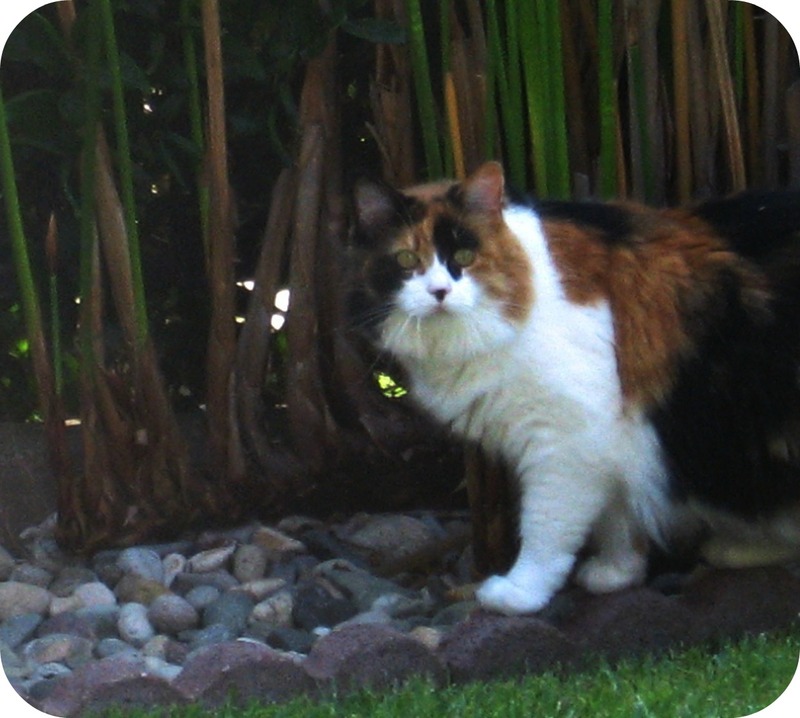 Thank you Chris for sharing your awesome neighbor Cat Friend with us! 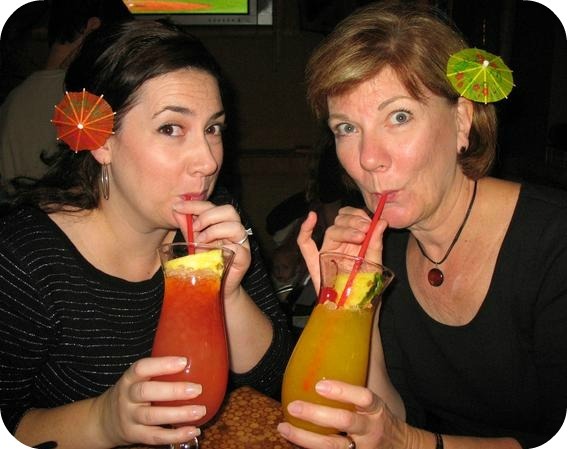 We all want to come visit you in paradise and hang out with Mai Tai, too! This past weekend I hosted a little party. The Second Annual Punkin’ Potluck Par-tay to be exact. The point of this soirée is to get together with a few friends and family members before the holidays and enjoy each other’s company and, umm, gorge ourselves on all things pumpkin! 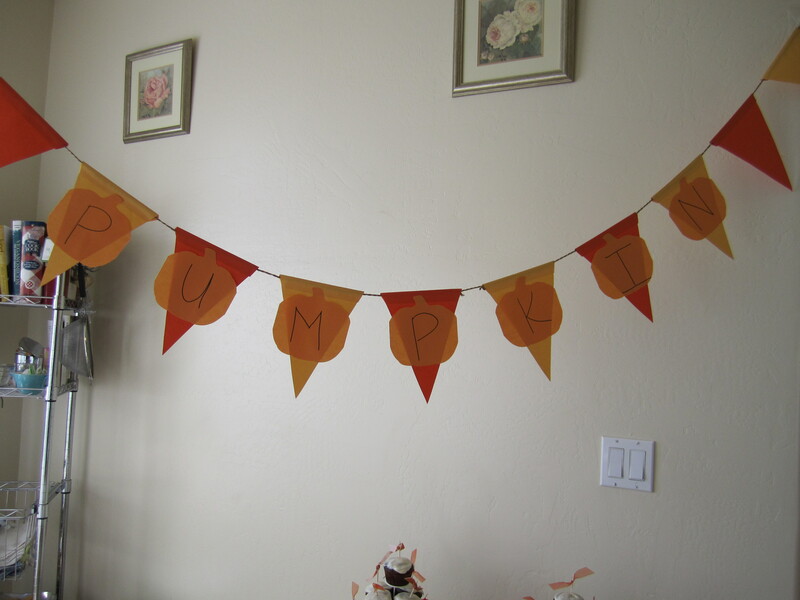 I kept the party of little smaller this year but there was no shortage of pumpkin deliciousness! My friends outdid themselves! And almost everyone made an effort to bring something vegan, even though there were only three actual vegans at the party. I made a main, savory dish, the Pumpkin Baked Ziti with Caramelized Onions from Veganomicon. This dish is always a hit with vegans and omnis. I made it for a yoga potluck once and people were freaking out about how good it was! 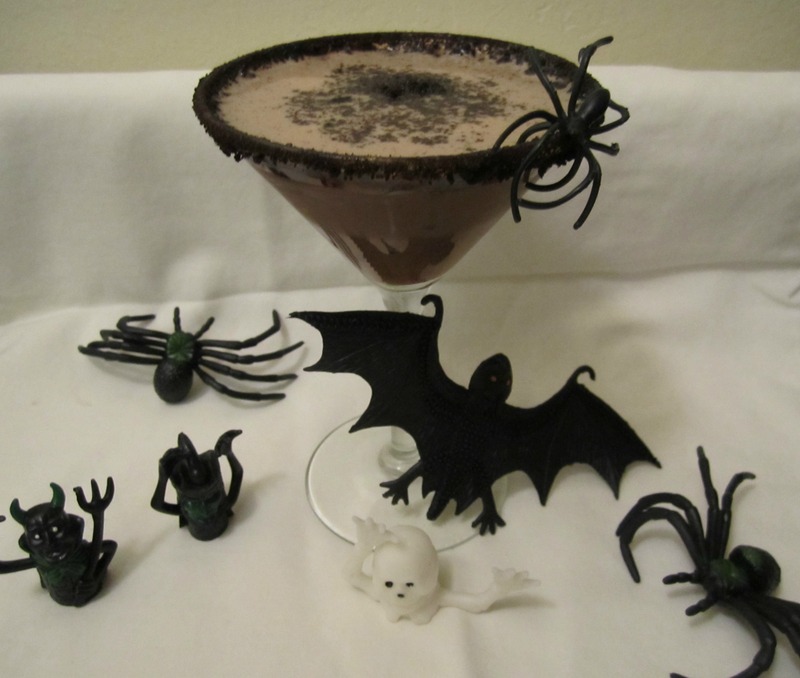 I made this last year for the Punkin Par-tay too and guests were anticipating it again this year. I couldn’t disappoint. Plus, I made an extra smaller dish of it so I’d be sure to have leftovers the rest of the week. 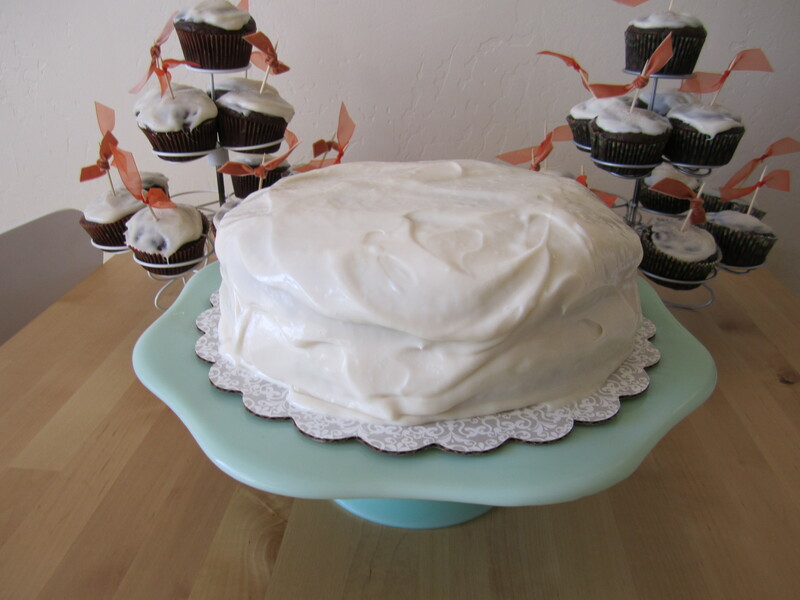 I also made a pumpkin spice cake with cream cheese frosting (veganizing a recipe I found online using a box of spice cake mix), chocolate pumpkin cupcakes (recipe from Cupcakes and Kale) and pumpkin scones. 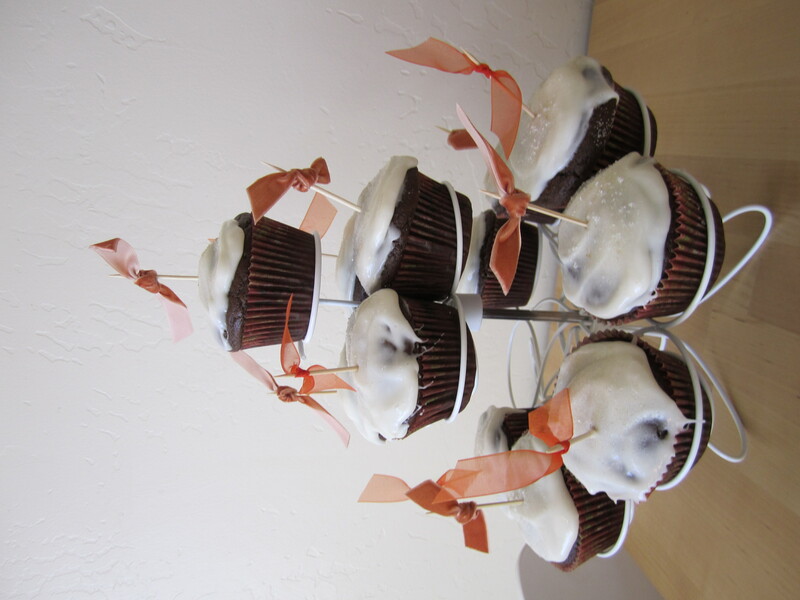 The guests brought an array of awesome: pumpkin-cream cheese-chocolate brownie bites, pumpkin cranberry cookies, and chocolate spice cake with the most insane chocolate icing that tasted like chocolate donut icing! There was a pumpkin brownie cheesecake, and my mom made a lovely Autumn Harvest soup that had pumpkin, carrots, sweet potatoes and butternut squash. Another friend brought some homemade spicy pumpkin butter! And I’m sure there’s a bunch of other stuff I’m forgetting! I served hot apple cider (spiked with Buttershots and, I swear, it tastes just like a caramel apple! 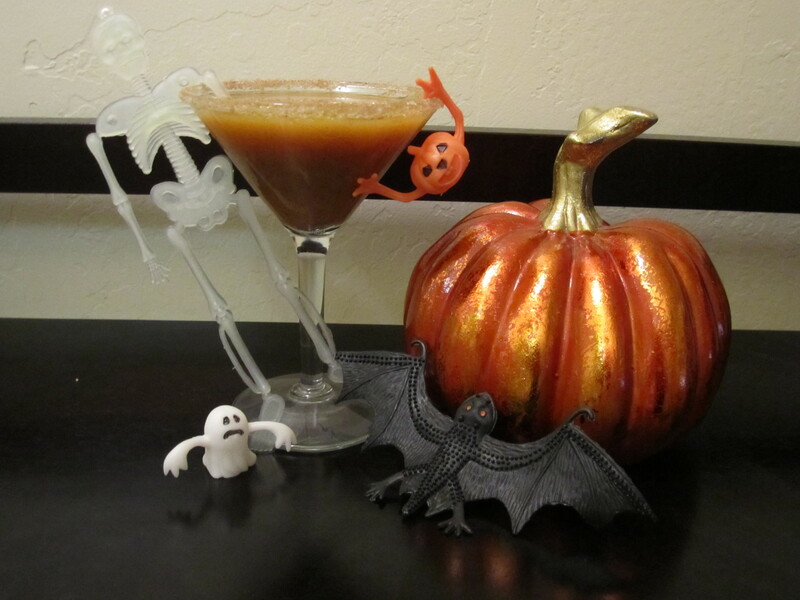 ), and the Great Pumpkin Martini made another appearance. 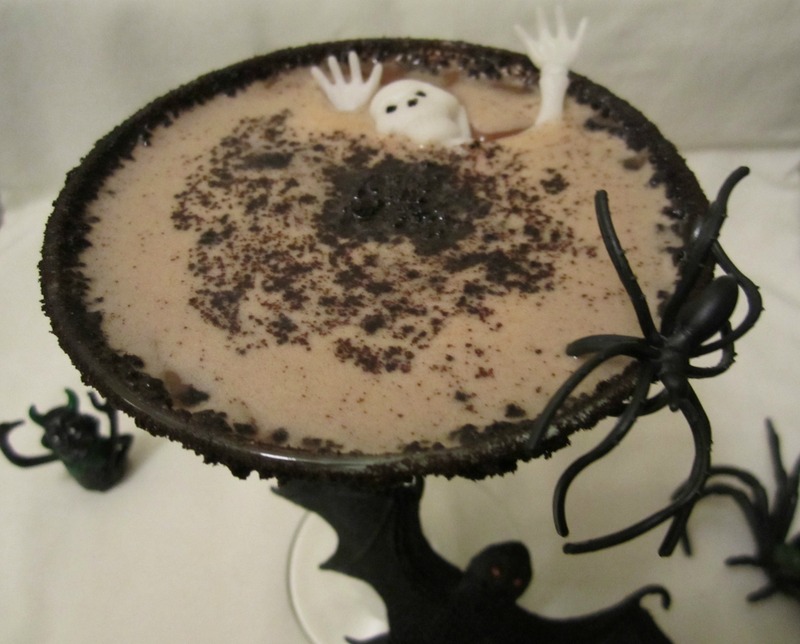 Although, without the spooky friends hanging on the side of the glass. 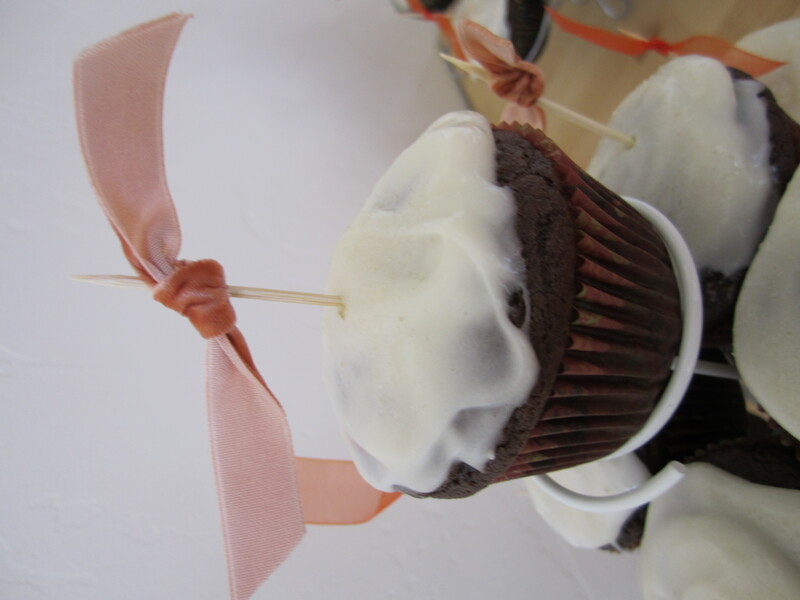 I had so much fun noshing all afternoon on pumpkin goodies. Can’t wait to do it again next year!